Some States Hike Gas Tax; Va. 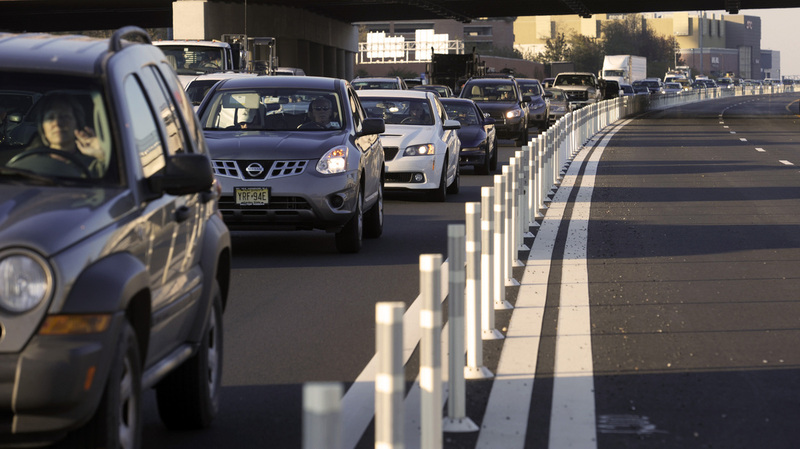 Tries New Route To Fund Roads : It's All Politics Revenues from gas taxes often fall short of what's needed for repairs and construction of the nation's roads, so states are starting to take action. Some are considering an increase in the state gas tax while others are getting creative. Drivers travel on Interstate 495, the Capital Beltway, near Tysons Corner in Fairfax County, Va., in November, just days before the opening of four new express lanes. Virginia is among 19 states that have approved or are considering legislation to increase transportation funding, according to Transportation for America. It's no secret that many of the nation's roads are in pretty bad shape. In the latest report card from the American Society of Civil Engineers, the condition of America's highways rated a grade of D.
Congestion is a big problem, and so is upkeep. Most states rely on gas taxes to raise the money for repairs and new construction, but that funding source is not the stream it used to be, says James Corless of Transportation for America. "Cars are getting more efficient, and people are actually driving less," Corless says. "So that has conspired really to put less revenues into these state and federal funds — trust funds out of the gasoline tax. So purchasing power is declining, and so states are getting creative." According to figures released by Transportation for America, which advocates for modernizing the nation's infrastructure, 19 states have approved or are considering legislation to increase transportation funding. One creative approach was taken by Virginia, which actually eliminated its gas tax while raising sales taxes and imposing a tax on wholesale fuel. The state is also allowing the congested Northern Virginia and Hampton Roads areas to raise their own tax revenue. Virginia Gov. 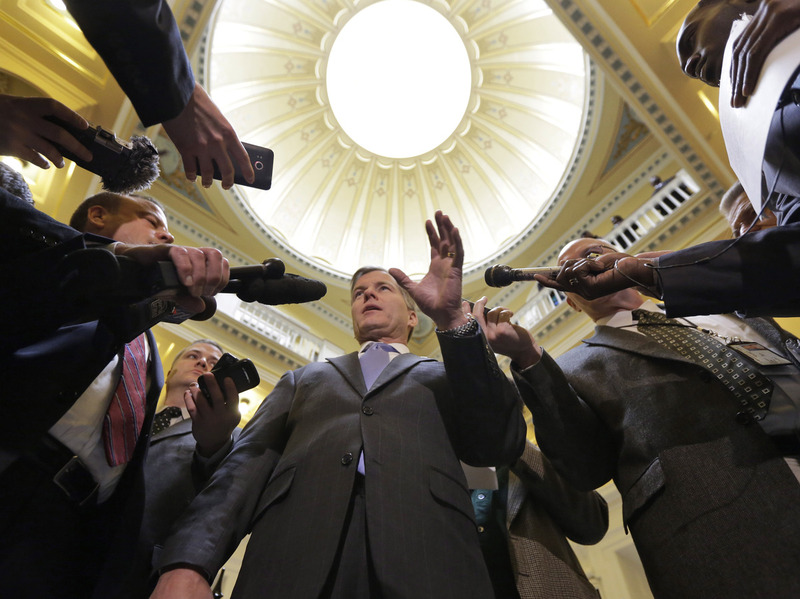 Bob McDonnell speaks to the media at the state Capitol in Richmond in February. Republican William Howell, the speaker of the Virginia House, helped broker the deal. "It was a true compromise," he says. "As with most any compromise, no one's 100 percent happy with every feature of it. There are some things that I'm not crazy about. I'm sure there's some features that other people don't relish. But we had to do it." Virginia's tax hikes were first proposed by Gov. Robert McDonnell, a Republican. And he's not the only GOP governor to approve revenue increases for transportation. Wyoming is raising its gas tax by 10 cents a gallon. Texas is considering steps, as is Iowa. It's "one of those things that is a political hot potato," says Democrat Tod Bowman, chairman of the Iowa Senate's Transportation Committee. "The issue at hand is ... we have a $215 million annual shortfall just to meet our most critical roadway needs. And so that's the problem we're trying to solve." States are acting this year after many years of inaction on transportation funding. Virginia's tax hikes were the first in 26 years. Neighboring Maryland also approved the first hike in its gas tax in more than two decades. Among the reasons for the states' actions, says Corless of Transportation for America, is that Congress approved a transportation bill last year without new revenues. "I think states were hopeful that Congress would step up, and they didn't," Corless says. "And then secondly, really, is ... the combination of the state budgets themselves getting hammered since 2007, but also really seriously a precipitous drop in revenues from the gasoline tax." The activity in the states comes in contrast to the gridlock in Washington. Congress hasn't raised the federal gas tax in 20 years. Howell, the Virginia House speaker, says agreeing to raise taxes in his state wasn't easy, but it shows the difference between the federal government and the states. "It was a lift, but I think it was a great example. When I talk to people about what we did in this session, I contrast what we did in Richmond to how things are going in Washington," he says. Despite the actions of states this year, there is more lifting ahead; the estimated gap between what is being spent on surface transportation and what is needed adds up to more than $800 billion.